This is the no sit-down simulator! 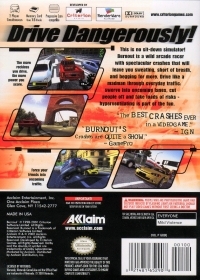 Burnout is a wild arcade racer with spectacular crashes that will leave you sweating, short of breath, and begging for more. Drive like a madman through everyday traffic:swerve into oncoming lanes, cut people off and take loads of risks - hyperventilating is part of the fun. 10-18-2014 kooru Box Text Drive Dangerously! This is the no sit-down simulator! 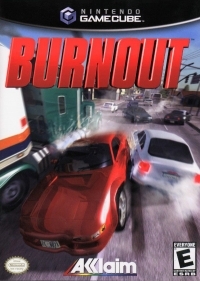 Burnout is a wild arcade racer with spectacular crashes that will leave you sweating, short of breath, and begging for more. Drive like a madman through everyday traffic:swerve into oncoming lanes, cut people off and take loads of risks - hyperventilating is part of the fun. This is a list of VGCollect users who have Burnout in their Collection. This is a list of VGCollect users who have Burnout in their Sell List. This is a list of VGCollect users who have Burnout in their Wish List.